This is one classic recipe from my every-day-recipe file. 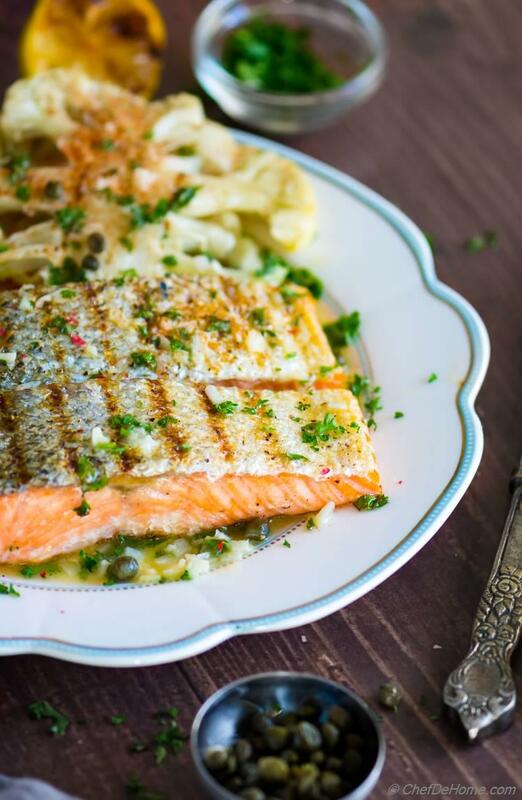 Grilled Salmon with Lemon-Butter Sauce is one of our favorite way to enjoy salmon for dinner. 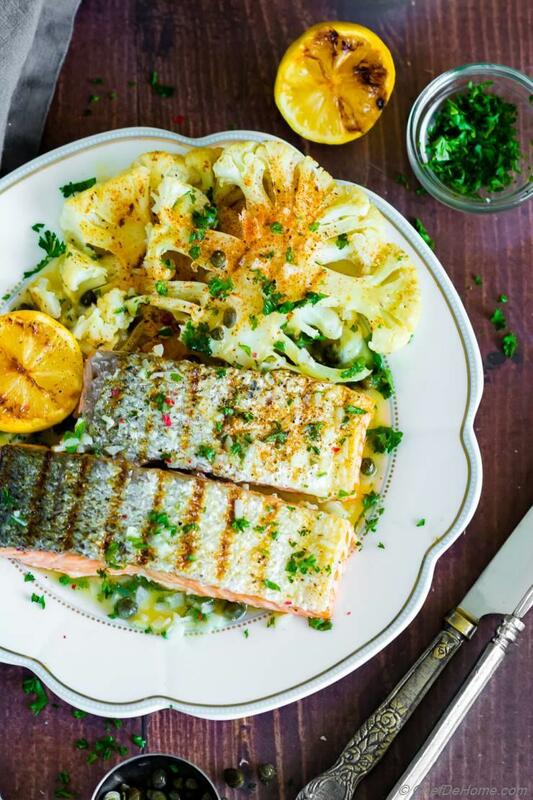 Perfectly grilled salmon (details ahead), moist and flaky with silky heavenly lemon and butter sauce. 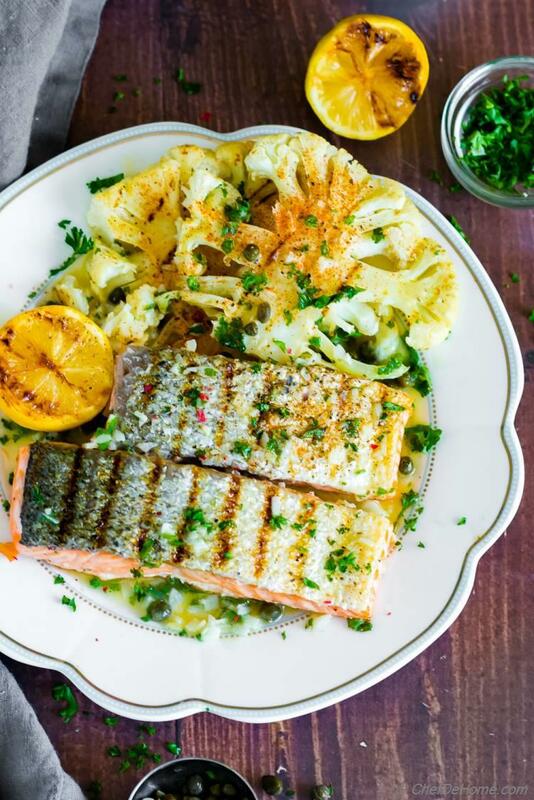 Today, I served it with grilled cauliflower steaks and charred lemon for an amazing Salmon dinner. Gluten free. Can you believe sauce needs less than 5 minutes? Salmon already cooks quickly. Really, under 20 minutes..
..and dinner says - I'm ready. In our home, Vishal is in-charge of grilling. Which works out well over the weekend. But when we have plans to eat grilled Salmon for weeknight dinner.. I even grill it indoor on my cast iron grill pan. Recently, when I made this salmon... I thought, why not I share this idea with you all and also give new life to my old favorite recipe. 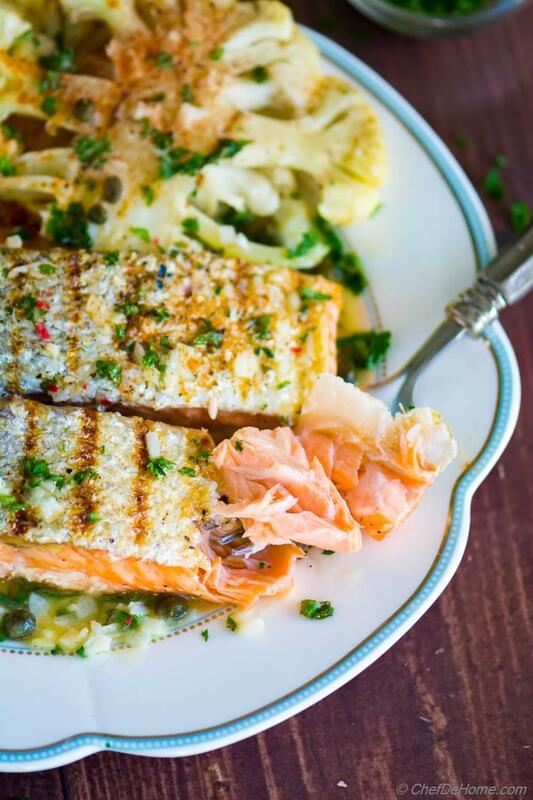 First, take a second and look at this flaky delicious grilled piece of salmon. Mouthwatering! Isn't it? 1) It results in moist and flaky grilled fish. Almost melt in mouth like buttery. 2) Plus it is quick, simple and easy. For this recipe, I grill salmon just seasoned with salt and black pepper. Works perfect every time. 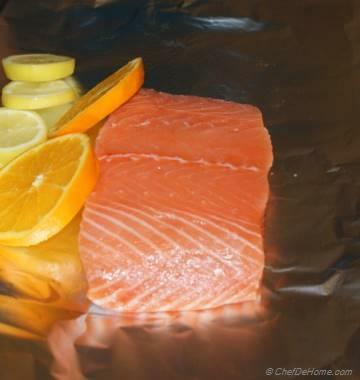 Indoor in cast-iron pan or outdoor on gas grill, there are few things to note when grilling salmon (as follows). If you follow these, you will never have grill-fish-gone-wrong kinda incidents. No sticking on grill or no fall-apart fish. 1) Pat dry salmon fillets from both sides. Always remember, moisture and grill don't like each other. 2) Rub the pat-dried salmon with coat of oil and also spray/brush oil on grill. I learned this the hard way. I often used to oil the grill but not the fish. Turns out, oiling both (little bit, not a lot) really helps avoid the sticky situation. 3) Always start grilling skin-side down. This crisps up the skin. Also, skin has less chances of sticking than the flesh. 4) Salmon cooks very quickly. Don't move around fish too much. Let grill do it's job on one side. This also ensures good looking grill marks. Once fish is done on one side, you will see bottom part of fish changing color… then, flip with tong or spatula. Again leave undisturbed until cooked to your liking. (second side does not need much time).. Follow these and I promise a perfect grilled salmon every time. 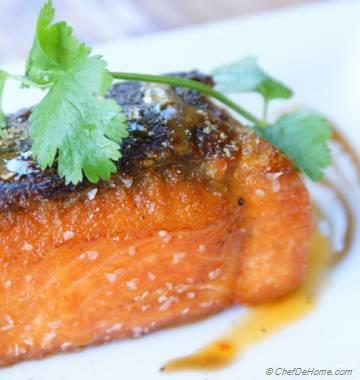 This recipe is so clean and simple you can use it as base for many other salmon recipes. Like, I served it with lemon butter sauce. You can serve with other sauce or marinade you prefer..
My personal favorites are Miso Salmon (flavor BOMB), Maple Chipotle Salmon, and Cedar Plank Salmon. 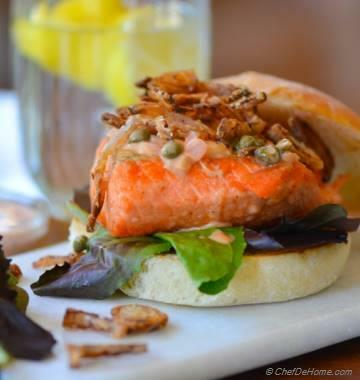 Oh, and I also have Salmon Burger recipe on blog which uses similar Lemon Sauce. I recommend checking it out. 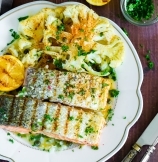 …Speaking of Lemon Sauce for Salmon brings me quintessential part of this recipe. The most delicious lemon and butter sauce. It is classic, simple, need only 4 ingredients with just 5 minutes prep time. To make sauce, I start by perfuming a little bit of butter with fresh chopped garlic. Once garlic is perfumed, I add more butter and lemon juice to create a creamy butter sauce. Pinch of seasoning and fresh herbs completes the sauce. Only trick is to not let butter break. (read instructions in complete recipe and watch video for details). Whenever I update a recipe, I like to keep an old photo for remembrance. First time when I made grilled salmon we were living in sunny California. Sun shined bright and not even a trace of fog or rain whole year. So, the picture you see below was grilled outdoor. Vishal insisted me to take one shot, in evening, very low-light, just before we sat to eat dinner. I never liked picture but grilled salmon with crispy skin, slathered in lemony butter sauce and side of asparagus and charred lemon was to die-for delicious. I shared it as-is with a promise to take pictures again. Thanks to all of you who trusted my recipe even with above picture so far. Honestly, recipe is the same. I have not changed a thing. I have so much faith in this salmon with lemony sauce, that if this salmon preparation is wrong, I don't want to be right. Only change you will see is the grilled cauliflower steak on side instead of asparagus. You are welcome to use any grill-friendly veggies you prefer. 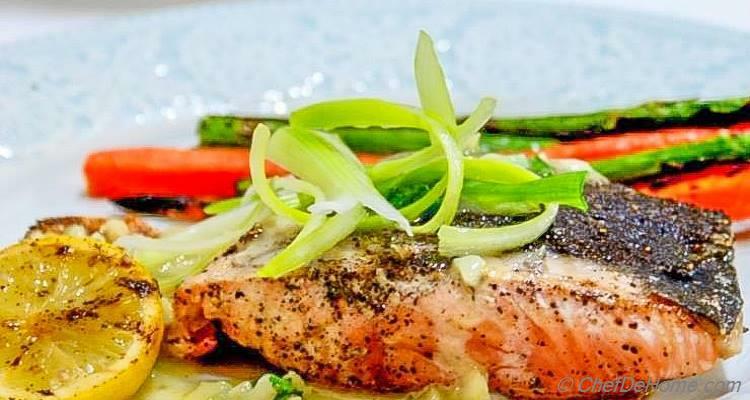 One more simple salmon recipe (updated) from my kitchen to yours. Smart Swap Use Cod Fillets or Shrimp with same sauce. 1. Pat dry Salmon fillets with paper towel. 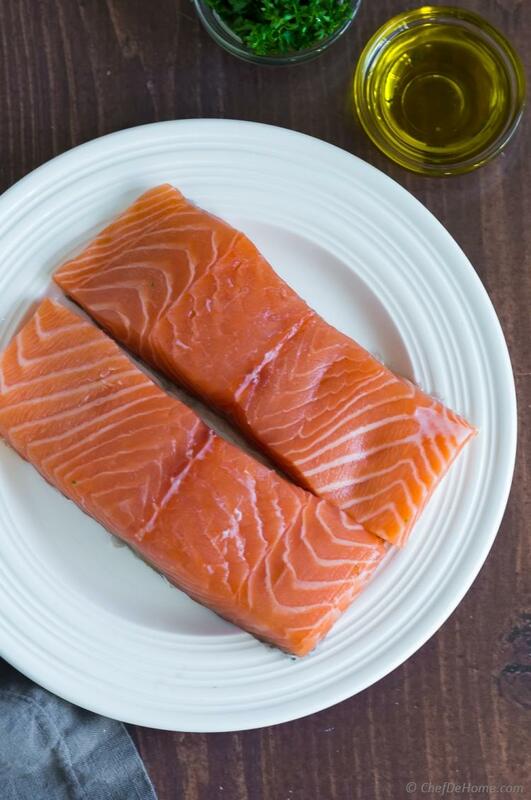 Drizzle olive oil over fillets and flip to generously coat both sides. Season skin side with salt and black pepper. On preheated grill, grill the salmon skin side down for 3-4 minutes. In meantime, season the top side. Then flip with wide spatula and grill additional 3 minutes. Remove grilled salmon on a plate. While salmon is grilling, cut a lemon into 4 thick slices, season with salt and black pepper, place on grill to get some char. Cooked lemon has concentrated flavor and it taste grate with grilled fish and veggies. You can also grill carrots if you prefer. 2. In a medium sauce pan, heat 1/2 tbsp butter. Add garlic and let it perfume the sauce for 20-35 sec. Don't let garlic burn. Add lemon juice and remaining butter. *Let the butter just melt and create a creamy sauce. Switch-off heat, remove from heat and add chopped parsley/cilantro, and season with salt and black pepper. 3. Divide salmon among two serving plates. Pour lemon-butter, divide equally. Garnish with scallion ribbons, carrots, and grilled lemon (if using). Sever immediately! **Read notes for grilling cauliflower steak as shown in picture. *Don't heat butter at high. Take off heat when you still see some butter chunks. These will melt in residual heat to make creamy non-broken sauce. **Grilled Cauliflower Steak: I like to cover cauliflower thick steaks in damp clean kitchen towel and microwave for 1-2 minutes or until slightly tender. then season with salt and pepper and grill until nice grill mark appear. Microwave helps cooking steaks evenly. **Grilled Salmon on Cast iron skillet: All directions are same as stated in Step 1 above. Only make sure iron skillet is heated through and brush oil on skillet before placing the salmon. Let it cook undisturbed before turning to cook other side. First posted on Oct 14, 2014. Updated pictures, video, and description Mar 7, 2018. So creative, simple and delicious. Excellent. Thanks Mikhail! We are glad you enjoyed.